The town with 8,710 inhabitants is situated on the southern shore of Lake Velence, at the gate of Transdanubia and at the junction of important roads. Due to the lake, the favourable climate and the natural values it has become a nationally famous resort. It is the administrative, service and tourism centre of Lake Velence resort district. Sights include: Roman Catholic church (1819) with altar piece under protection and late baroque (1784) Calvinist church at Agárd. Nearby in Agárd-puszta, native house of the novelist Géza Gárdonyi. 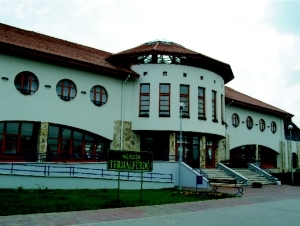 The first indoor thermal bath at the lake, the only one in county Fejér, was opened in Agárd in 1984. The completely renewed and extended bath has been awaiting visitors since 2005. Town with 8,273 residents on the southern shore of Lake Velence built together with Gárdony. A popular holiday resort with beach and lively traffic.